Face2Face Spa Studio (www.face2facespastudio.com) located at 6805 W Roosevelt Rd, offers the best in skin care, makeup, microblading, massage, waxing, body sculpting and contouring to achieve beautiful, healthy skin. A ribbon cutting was held in partnership with the City of Berwyn and the Berwyn Development Corporation (BDC) on May 4th. For more information on Face2Face Spa Studio, please visit www.face2facespastudio.com or call (708) 737-1200. For more information, visit whyberwyn.com. 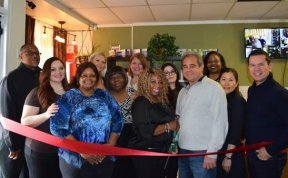 Face2Face Spa Studio celebrated a grand opening on May 4.